"How are you doing today, Tom?" "Not bad, Marty. How 'bout yourself?" "Well I'm feeling a little extra special today." "I know what you're talking about, Marty. Our boys did OK with the family business, didn't they?" "I'll say. I tell you we must have some pretty good genes in this family, Tom. Not many businesses, much less a body shop, are able to celebrate their 100th birthday." "You said it. Those boys sure have made us proud. Who would have thought our sons, and our son's sons, and soon our son's son's sons, would have been able to carry on the business for so many years?" "Boy, sometimes I really miss it. You know what I'm talking about, Marty?" "I sure do. But rest assured, Tom, Fitzpatrick Brothers Corporation is in good hands." "Yeah, you're right. And it's hard not to smile today." Harry Fitzpatrick, and his younger brother Franny, couldn't even venture to guess how many cars their family has fixed for people over the years. 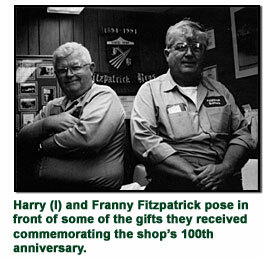 When they celebrated the business' 100th year on September 8, 1994, the Fitzpatricks mailed over 1,000 thank-you cards to all the names accumulated in their database. What's so impressive about that? Well, they have only owned a computer for six years. "How many people does that mean our family has dealt with in 100 years?" Harry pondered. To put some perspective on how long Fitzpatrick Brothers has been in business, take a look at these numbers: the Civil War had ended a mere 29 years before the business opened. In 1894 the sport of basketball was only three years old, Dwight Eisenhower was four, the camera was six, the Statue of Liberty was eight, Einstein was 15, Grover Cleveland was president then, and x-rays wouldn't be invented for another year. They have endured six wars, countless recessions, a number of fires and one Great Depression. Harry can remember seeing nothing but apple orchards and trees between their shop in Dorchester and Boston's Government Center some 10 miles away. Never trying to be "big-time operators," as Harry described, the Fitzpatrick generations have adapted with a changing economy, a rapidly changing industry and a changing world through ten decades. Harry remembers getting his official start in the family business 40 years ago when his father taught him how to paint cars and trucks with a paint brush. And when people snicker, Harry will tell you that method was better than any fancy spray gun. And he should know because the Fitzpatricks were the first in Boston to use guns in the late 1920s. Thank goodness the business prevailed over the years because Harry and Franny might be house painters today, they say with a smile. Though the business is one of the oldest in the country, Harry and Franny will tell you they are lucky to be here. From 1931 to 1937, their father and his brother (Harry and Tom), rode out the Great Depression through a community bartering effort. Cash was almost non-existent. Weekly salaries averaged $5, and if you could sweep the floor for a quarter you were doing pretty well for yourself. If they needed groceries, no problem; they repaired the grocer's truck. Need some hardware supplies? Surely the store owner was in need of a paint job. When the electrician needed some work done on his car, he'd offer to rewire your building. And that's how it worked. It was, perhaps, an early sign that a venture in business would encounter its fair share of speed bumps. The days of repairing carriages and wagons, as the family did in the late 1800s, were over. As far back as the early 1900s, soon after the invention of the automobile, Tom and Marty, like other repairers, were faced with a difficult decision: Should they get into the business of repairing motor-powered vehicles? It's a question that draws a smirk these days, but back then, most repairers feared the technology and lacked the skills, knowledge and tools to even consider getting their hands on one of those thingamajigs. 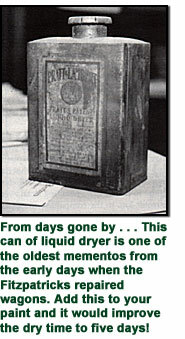 Fitzpatrick Brothers, however, had the foresight to take on the repair work. "Over the years," Harry says, "the business was always able to stay with the times, unlike some of our competitors. That is one area where we have been fortunate." Thomas and Martin Fitzpatrick, the founders of Fitzpatrick Brothers, smile from above when they see their great grandson Neale using the shop's Genesis Laser Measuring system, alongside Harry's other son Scott. It's nothing like the dolly and hammer they used. They scratch their heads as they see Harry and Franny cranking out estimates on their CCC EZEst estimating system and sending them to commercial customers through their Photophone video imaging machine. They didn't even have to write estimates when they started. And a fax machine? Well heck, they were just beginning to understand the telephone. "Gee, Marty," Tom says, "we just had pencil and paper. And what's up with that infrared drying system? If we wanted a quicker dry time, all we could do was park a carriage in the sun and hope it wasn't a windy day." "You ain't kidding, Tom. Whatever happened to the wooden cars we repaired with planers, joiners and dowel equipment?" "Your guess is as good as mine, Marty." Packards and Hudsons were typical jobs in those days. And later, in the 1920s, body work was on the rise and by the 1930s Fitzpatrick Brothers was handling other commercial work. "We had a railway that came through the property," which is today a tunnel, Franny described. "The train would come through the yard and drop off cars. Most were primary colors then. We did a lot of blacks, greens and blues." By the 1940s the Fitzpatricks had more work than they could handle, literally. World War II drafted a large chunk of their work force, and the days grew longer and harder. World War I didn't touch the Fitzpatrick business quite the way the WW II did. The first was largely volunteer. But when the Japanese attacked Pearl Harbor and Hitler was trying to make Europe his backyard, it seemed virtually every American knew someone who was called to battle. And it was no different for the Fitzpatricks. It wasn't until the '50s that the business would see its most significant transformation since gasoline. No longer would insurance companies simply acknowledge a claim and send a check. They wanted to see the work now. "The business became really tough," said Franny. "Insurance companies began insisting on negotiating. You had to deal with an agent and present him with your bill. And those were days when $200 and $300 jobs were major operations." In the later part of the decade and into the early '60s, Franny remembers insurers were looking to save money through the use of re-chromed bumpers and LKQ parts. For comparison's sake, look no further than the red sign that hangs on the front of the Fitzpatricks' building these days. It reads, "$75 for full detailing." A trip in the time machine back to 1954 shows an invoice where $75 would get you a complete deluxe paint job. For $55 you could have a complete nose replaced and that was when cars moved slowly and front ends were heavy. In the late '50s, concerned with the "enormous total accident bill" they were paying, insurers circulated a flyer explaining that "despite every indication that the number and costs of accidents will continue to rise in 1957, resulting in an even greater loss to the companies, the Commissioner of Insurance merely continued into 1957 virtually the same compulsory insurance rates which proved so grossly inadequate in 1956. Obviously, the insurance companies must receive adequate rates to meet their responsibilities to their policyholders and accident victims." "Therefore, the companies have been compelled to take the only course provided by law. They have appealed to the Supreme Judicial Court to set aside the inadequate rates fixed by the State Commissioner for 1957. In all fairness, we want you to know that if the rates are later revised to a fair and reasonable level as a result of this Court action, it will be necessary to adjust your automobile insurance premiums accordingly." By 1963, as a result of this single document, a number of body shop owners felt it was in their best interest to combine their efforts and protect themselves against infringements of their rights. 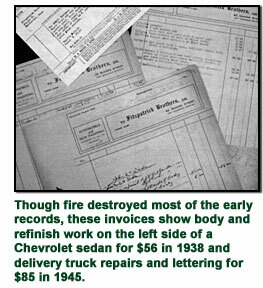 Franny Fitzpatrick was among them and it was the beginning of what is today the Massachusetts Auto Body Association. In '64, one of the Association's first feathers was having "paint and materials" included on appraisals. "Dad, Franny and I used to go to all the meetings," Harry recalled. "But quite frankly, I thought they were a waste of time. They were so aggravating." Unlike Harry and his Dad, Franny stayed. And Franny never left. "I knew that we could get along with the guy down the street," Franny remembered. "I knew that we had the same interests at heart and we needed one another." "I've seen Franny's victories and I've seen his defeats," Harry adds. "He has put in a tremendous amount of time away from his family and business with little recognition. There were nights when he would go out to fundraisers until three or four in the morning and yet he would still be here for work when the doors opened in the morning. But it's not about recognition or making your own business better. It was, and still is, all about making this a better industry. And Franny proved that it can work." Nicknamed "The Historian" by his peers, Franny served as president of the Association from '72 to '74, and after holding a number of positions with the organization, he has settled as treasurer. If the Fitzpatricks could pick a decade to go back to, they might just as well choose the '60s. Supported by a growing customer base and strengthened by an increasing commercial business, the Fitzpatricks were doing so well that they refused to do business with two insurance companies. But that would all change after the Automobile Insurance Reform Act of 1988. Sure there were some dips in monthly figures from the mid-'60s through the mid-'80s. But never was there a period that set the business back so drastically since the Great Depression. They never faced changes like those of the late '80s. The similarities were frightening: from 1929 to 1942 Fitzpatrick Brothers' work-force dropped from 39 employees down to two. Between 1988 and 1991, they went from 17 employees to six. "What was alarming," Franny says, "is that we maintained a flow of work but we didn't have any money to show for it. 1988 to 1991 was a much tougher period. We were very concerned." "We could probably fill a phone book with all the changes that this business and this industry has gone through," Harry says. "We were young with a lot of ideas and our father never held us back. If we made a mistake, he chalked it up as a learning experience. And that's how they came into the business." What made a difference, the brothers say, is that nobody in the family was ever mandated to work for the family business. Harry and Franny's father and uncle never asked them to give up their accounting and radio engineering degrees respectively. They chose the family business like their father and his brother. Harry's two sons, Neale and Scott, have continued the tradition. "It's funny how things work out," Franny philosophized. "We have always had two Fitzpatrick brothers running the business with two more stepping in. We have all wanted to be a part of this. In this day and age when families are falling apart, it's nice to see this kind of longevity." Many visitors stopped by Fitzpatrick Brothers on September 8. Faxes came in from all over. The phone rang off the hook and visitors stopped by with fruit baskets. And as those messages flowed in, it began to strike Harry and Franny just how long they have been around and how so many people made this all possible. They remembered family members who were no longer with them, including some long-term employees who recently passed on. Winston Jack, a native of Trinidad and a member of the Fitzpatrick family for 20 years, passed away in November of '93. And George Mellor: he was with the Fitzpatricks for just as long, but died a mere two months ago. "We wish they could all be here," Franny said. Business was done on September 8, 1994. And Harry and Franny made sure the place was locked like they do every night. As they walked away Franny said to his brother, "You know, Harry, I bet we made them proud today." "You're right, Franny. I bet they're smiling as we speak." "I'll see you tomorrow. Harry."